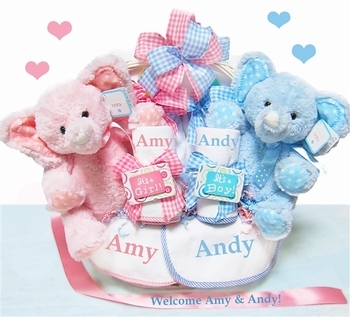 Double the fun with this personalized gift basket for the new twins! Available in your choice of gender combinations. This beautiful ensemble offers both practical necessities for mom, plush toys for the twins and adorable embroidered bibs and burp cloths with their name on each one! This unique twins gift ships for free, arrives wrapped in cello and is certain to impress! Got this for my sister and she LOVES IT! Everything is so cute and the baby names turned out perfectly. This is a really great basket for twins! This is the perfect gift for newborn twins. It's not only adorable, but has items that can be used right away. Mom and Dad loved this gift and I'm sure the bears will be cherished for years to come!